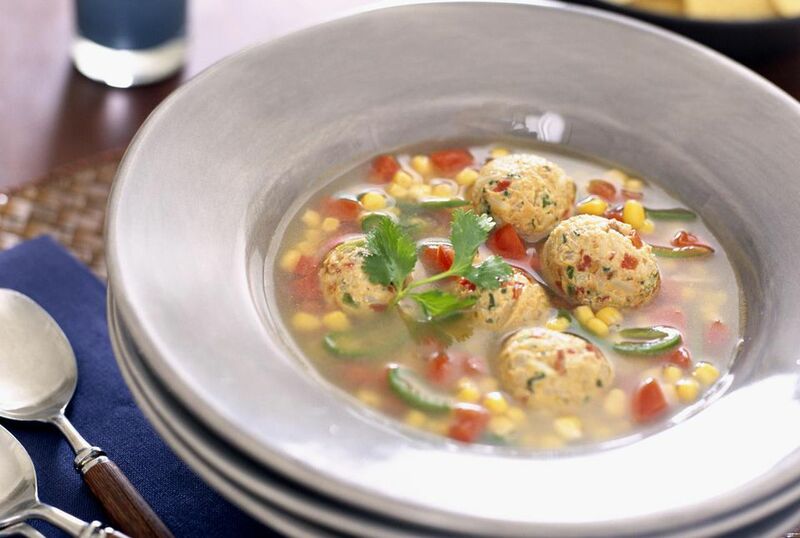 Mexican albondigas meatball soup is a great way to stretch a pound of ground beef to feed 10 people. The tasty soup is loaded with vegetables and rice. This is a truly satisfying meal when needing to feel a large group of people. Recipe reprinted with permission from Better Homes and Gardens Mexican Cooking (Better Homes and Gardens). In a large saucepan cook onion and garlic in hot oil till onion is tender but not brown. Stir in water, broth, and tomato paste. Bring to boiling; add potatoes and carrots. Simmer for 5 minutes. Meanwhile combine egg, cilantro or parsley, salt, oregano, and pepper. Add ground beef and uncooked rice. Mix well. Form mixture into 1-inch meatballs. Add meatballs, a few at a time, to the simmering soup. Return to boiling; reduce heat and simmer about 30 minutes or till meatballs and vegetables are done.